1. Hepatalgia: Continuous dull pain in hepatic region of right upper quadrant is an important and the most frequent symptom of primary hepatic carcinoma. It is caused by rapidly increasing liver which make liver capsule tense or by malignant tumors’ violation of liver capsule or peritoneum. It can be continuous dull pain or gas pain. When malignant tumors violate diaphragma, patient will feel pain in right shoulder or right back. Tumors growing toward rear right can cause pain in right waist. When cancer nodules rupture, necrotic cancer tissues and blood flow into abdomen. Then patient suffers severe abdominal pain. Symptoms and signs of peritonitis appear. 2. 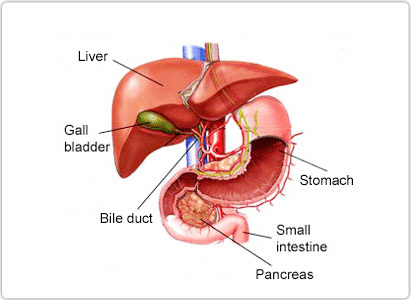 Hepatomegaly: It is the most frequent sign of primary liver cancer. Liver is increasing swelling, solid with uneven surface. Different-size tubercles or lumps cause local eminence, untidily borderline with tenderness. 3. Jaundice: One third of patients suffer it. Mostly, it occurs at an advanced stage liver cancer. And it is caused by damage of liver cells or by malignant tumors which press bile duct. 4. Fever: In general, patient suffers low-grade fever, occasionally above 39℃. It can be continuous low-grade fever or irregular hyperpyrexia. The reason is that organism absorbs a large quantity of damaged tumor tissues. Or it may be result of cholangitis or concurrent infection caused by malignant tumors pressing bile duct. 5. Alimentary canal and general symptoms: Decreased food appetite, dyspepsia, nausea, emesia, diarrhea, acratia, maciei, asthenia universalis and cachexia. 6. Symptoms of metastasis: Relative symptoms appear when liver cancer with metastasis to stomach, bone, pelvis cavity and brain. For example, pulmonary metastasis cause cough and emptysis; pleural metastasis cause chest pain and bloody hydrothorax; osseous metastasis cause local pain or pathologic fracture; metastasis to spinal column or press spinal nerves can cause local pain and paraplegia; Brain metastasis can cause headache, emesis and signs of nerve localization. 7. Other symptoms: Endocrine syndrome or metabolic endocrine, also called syndrome associated with cancer, are caused by abnormal metabolism in malignant tumors. (1) Spontaneous hypoglycemia: 10% to 30% of patients suffer it. It is caused by liver cells secreting insulin or insulin-like substance not only in pancreatic islet. It is also caused by hepatocellular carcinoma tissue consuming too much glucose. Sever patients may hepatocyte, shock even die. (2) Globulism: 2% to 10% patients suffer it. It is caused by increasing haemopoietin in circulation. (3) Others: There are also hyperlipemia, hypercalcinemia, carcinoid syndrome, gonadotrophins syndrome, skin porphyria and dysfibrinogenemia. These symptoms may be related to synthesis of paraprotein, dystopia endocrine seretion and porphyrin metabolism disorder in liver cancer tissue.